Trump on Tuesday will become the first sitting U.S. leader to meet a member of North Korea’s Kim dynasty. It won’t be easy to immediately judge whether the shift in strategy proved successful, as Pyongyang’s previous pledges to denuclearize and abandon weapons facilities later proved unenforceable. 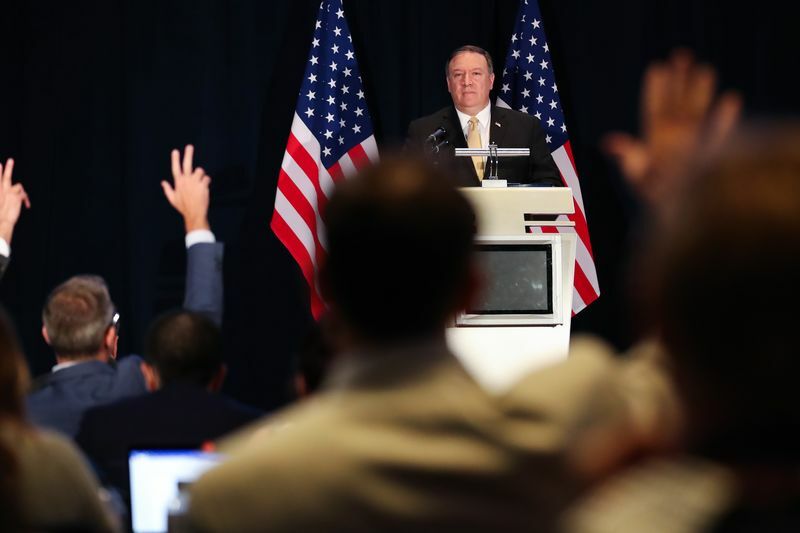 Secretary of State Mike Pompeo on Monday acknowledged the U.S. had been fooled by North Korea in the past. But he said repeatedly that Trump’s approach made this attempt at an agreement “radically different” from any that came before by keeping sanctions in place, offering “unique” security guarantees and putting in a strong verification regime. For diplomats and analysts familiar with the U.S.’s 25-plus years of trying to pressure a reclusive dictatorship to abandon its nuclear program, expectations of Tuesday’s meeting are low. Any outcome that avoids a return to the “fire and fury” threats of last year and neither betrays allies nor prematurely eases sanctions would be seen as a success. The politics of the summit are likely to be different, however. For Kim, the meeting will already be a unique achievement: His father and grandfather before him sought one-on-one summits with U.S. presidents, but neither succeeded. The meeting will offer him legitimacy and international acceptance that will prove invaluable at home. The bar set by Trump and his team is much higher: To get the “complete, verifiable and irreversible dismantlement” that has eluded previous administrations, with a deal that’s tougher than the 2015 Joint Comprehensive Plan of Action with Iran. Trump withdrew from that multinational deal last month, on grounds that it was unacceptably weak. Most of the key words and phrases likely to appear in any joint Trump-Kim communique — such as “denuclearization,” “abandonment,” “verification” and “normalization” — have been committed to before. Whether this time is different remains to be seen. North Korea began its nuclear program with the help of the Soviet Union in the 1960s after the U.S. introduced atomic weapons to South Korea. It isn’t clear exactly when Pyongyang’s leaders embarked on a bid for weapons, but they refused to join the Nuclear non-Proliferation Treaty with most other nations in 1968. It wasn’t until 1985, as the Cold War was coming to a close, that North Korea joined the NPT under pressure from Moscow. The treaty commits signatories that don’t already have nuclear weapons not to develop them. They’re also supposed to adopt a safeguards agreement that provides access to United Nations inspectors from the International Atomic Energy Agency in Vienna. North Korea didn’t take that step. In 1986 they started operating a small reactor capable of producing plutonium for weapons, and building two larger ones. Nevertheless, the U.S. unilaterally withdrew its nuclear weapons from the peninsula in 1991. Talks with South Korea later resulted in the first of numerous agreements to come, aimed at retarding or ending the weapons program. The brief six-paragraph joint declaration for the first time committed both sides to the Korean Peninsula’s “denuclearization,’’ a term whose uncertain definition remains at the core of Tuesday’s talks between Trump and Kim. The two sides pledged not to “test, manufacture, produce, receive, possess, store, deploy or use nuclear weapons.’’ North Korea has since done all but use them. Ten days after the Joint Declaration, North Korea signed another deal accepting the IAEA’s safeguards. But a year later, when inspectors tried to invoke a clause that allows them the right to inspect an undeclared facility, North Korea refused them access. It also said it was withdrawing from the NPT. The 16 months of negotiation that followed included former U.S. President Jimmy Carter’s first trip to Pyongyang, where he claimed to have secured an agreement from Kim’s grandfather, Kim Il Sung, to freeze the nuclear program. In exchange, Carter told the elder Kim that the U.S. was lifting economic sanctions. The Clinton administration disowned Carter’s sanctions pledge and sought to negotiate a more substantive deal. Direct negotiations ended with the U.S.-DPRK Agreed Framework/Six-Party Talks, under which Pyongyang offered to freeze its plutonium producing reactors and “eventually” dismantle them. The U.S. in return offered help replacing the reactors with light water ones that pose less of a proliferation risk. It also offered 500,000 tons of oil in annual fuel aid, to compensate for lost energy during the transition, as well as financing to make safe the spent fuel rods. The Framework went further, launching a process to reduce barriers to trade and investment in North Korea, and to normalize U.S.-North Korean relations. It also mandated North Korea to stay in the NPT and renew IAEA inspections. In 2002, George W. Bush’s administration terminated the Agreed Framework. The North Koreans had begun enriching uranium, an alternative route to producing the fuel for nuclear weapons not covered under the 1994 deal. North Korea then implemented the decision to leave the NPT that it had suspended almost a decade earlier. That ended IAEA inspections, too. In 2006, North Korea tested its first nuclear bomb. The 2005 statement was just the start of a process, much as Tuesday’s summit is likely to be. An action plan 17 months later set out some initial steps, including the establishment of five working groups. North Korea was supposed to “shut down and seal” the plutonium-producing reactors at Yongbyon, with a view to its “eventual abandonment.” It also had to start discussions on how to dispose of spent fuel, and to begin a full declaration of nuclear assets. The U.S., for its part, agreed to start talks on normalizing relations and to deliver the first shipment of fuel oil. A second round of implementation plans pledged North Korea to “disable” all of its nuclear facilities, again with a view to later “abandonment.” Yongbyon was to be disabled by December. A million tons of fuel oil were to be delivered. Since then, North Korea has conducted numerous nuclear and missile tests, culminating in its claim last year that it had the capability to strike the U.S. with a nuclear weapon. An April summit between Kim and South Korean President Moon Jae-in produced the most recent agreement, in which the two sides recommitted to earlier bilateral deals and to pursuit of both a lasting peace treaty and the “complete denuclearization of the Korean Peninsula.” That summit laid the foundation for Trump’s meeting with Kim on Tuesday.